There are few bigger names in the sports betting sector than Coral. It’s taken decades to build the brand up to where they are now and whilst you could argue that they possibly aren’t right at the top, they are definitely a name you throw into the hat as being one of the best. A lot of their good work has come on the back of football betting, a sector that has served the company extremely well over the years. The site has been able to develop a keen understanding for what’s needed from their punters, especially those based in the UK, as coral are. This review will be looking at how the football betting sector of the site works and more importantly, if it’s any good or not. As one of the more popular sportsbooks in the industry a the minute you would associate a bookmaker like Coral with having a pretty solid pricing structure, which is exactly what you’re going to find. The one thing that we did find is that rarely were Coral best priced on the markets that we tested, which was a little surprising to be honest. These Premier League games are often fiercely contested, but from the 20 or so upcoming matches that were on offer to test within the Match Result market, we only found Coral to be best or equal best price on 1 occasion, and even that was a 26/1 outsider bet. This was actually a very disappointing find to be honest and we did expect to see them battling out with the best. But, when digging a little deeper we realised that whilst they weren’t best price, they were never too far behind really. However, we would have to say that on the whole the betting and pricing structure for Premier League games were very disappointing. If this were a bookmaker that is fairly new to the industry and didn’t have a huge following, then we would say fair enough. For a company like Coral, it’s surprising and not good enough. One thing that we will say is that the sample size of our test is pretty limited. We can only look at games they are offering on odds though, which is roughly 15 at the minute, so it is worth bearing this in mind. We were highly surprised at how poor they were though and whilst not conclusive as such, it’s not a great start. As we moved down the leagues to the likes of the Championship, League 1 and League 2, there was much better news to be found. They had a much higher percentage of games and market’s where they were best or joint best prices for a number of different bets. They seemed to be strong in pretty all three of the leagues as well, which was great to see. Below is a typical example of their structure and whilst they aren’t best priced on their own, they were pretty competitive with all three results from this match. The Premier League findings could be a glitch in the matric, but from what we have found they seem to be a much better outfit for games in the lower leagues than that of the Premier League. Market coverage on the other hand is where Coral really excel and with around 200 to choose from within the top flight and not too many less as you work your way through the lower leagues, we think that they are one of the best. What was impressive to see is that the coverage was very diverse. They had a number of games and markets that many bookies don’t offer, of which we will discuss later in this article. 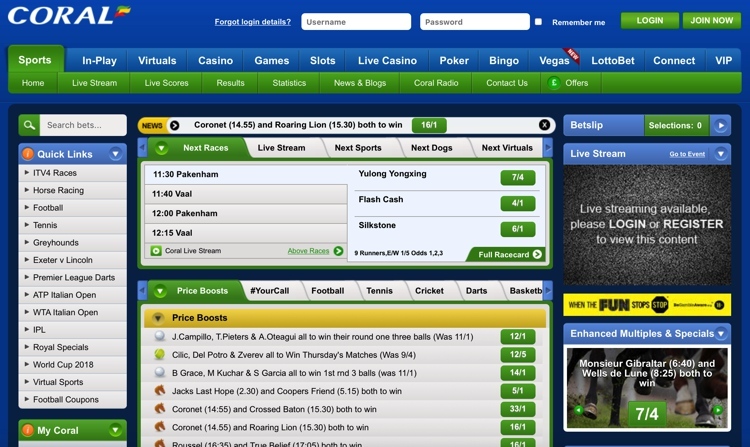 The layout of this section of the site is great as well as you can jump between groups of bets within the bookmaker to find exactly where you are looking to get to. As you would expect from a bookmaker as big as Coral, internationally they are excellent in the league and markets that they offer. Like most, leagues such as Serie A, La Liga, Bundesliga and Ligue 1 dominate, but it’s certainly not limited to just those. Another positive was that the market coverage on offer was really good for these games as well. They seem to offer almost the carbon copy of bets that you can place on English game, with many of the bigger games getting around 180 bets to choose from. To give you an idea of scale, the site also includes around 150 markets for Spanish Segunda division, which is essentially Spain’s version of the Championship. As a final note on this, we found pricing on the whole to be really good. We have heard reports previously that they were particularly good with market’s aboard and we can confirm that this is the case. In fact, we might even be willing to say that they are more suited to punters looking to bet on these games than the UK, which something that we’ve not actually something we’ve come across previously. Coral have jumped on the bandwagon of allowing punters to create their own bets with their feature of Your Call. All you need to do to access it is simply tweet Coral using the hashtag #yourcall and they will try and get your bet live for you. It works in much the same way as other bookies do in that the bet goes off to the traders and then they come up with a price. What you get additionally from coral is that they are often more included to offer up a wider range of markets, which in turn means you can be a bit more selective in which bets you choose. For example, they often include a certain number of shots a player might have or even a number of tackles they might have. Below shows a great example of how diverse they are and also the price that they are offering for these types of bets. It’s worth noting that you are able to bet on other people’s picks as well. The bets above are both bets that have been tweeted into Coral by other users and as the game draws nearer, this list will start to grow. 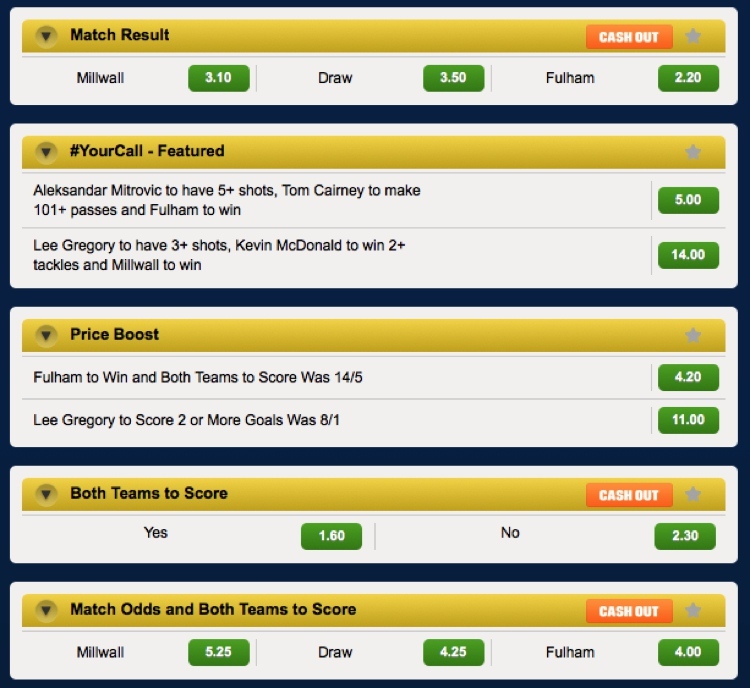 As we briefly mentioned earlier, Coral have a number of fairly unusual markets to choose from within the bookmaker. One of those is that of the ‘Player to outscore the opposition’. It’s pretty straightforward in that you back a player to score more goals than the team they are playing against. It’s not a market that we’ve seen before and certainly a little different. It’s interesting because it’s one that you can really take advantage of as a possible alternative to the goalscorer market. Whilst we aren’t going into strategy with this article, you could look at games where strong favourites are playing against weaker teams who are unlikely to score at all. Another one that we came across if the first goalscorer for either the home team or the away team. Again, it’s an adaptation of different goalscorer markets but another that isn’t all that common within the industry. A massive feature on site is that of the live streaming functionality. It offers you a huge range of football games to choose from, including the likes of La Liga, Serie A, Bundesliga and many, many more. The streams are some of the best we have seen and whilst not quite HD, they do hold strong even when blown up to be quite big. Accessing on your mobile is probably best bet though as this offers a crisper finish in our opinion. It includes over 2,000 events per week, many of those football matches. All you need to access the games is to have a funded account. This could be as little as £1, so it’s probably going to work out to be the cheapest sports TV subscription you are going to purchase. It is worth noting that there aren’t many UK games to talk of, aside from a few lower league and cup games because of streaming rights. A blog within a bookmaker certainly isn’t the most innovative feature that you can find, but coral’s is one that we thought really worth noting. The site comes packed with articles and is updated every day. 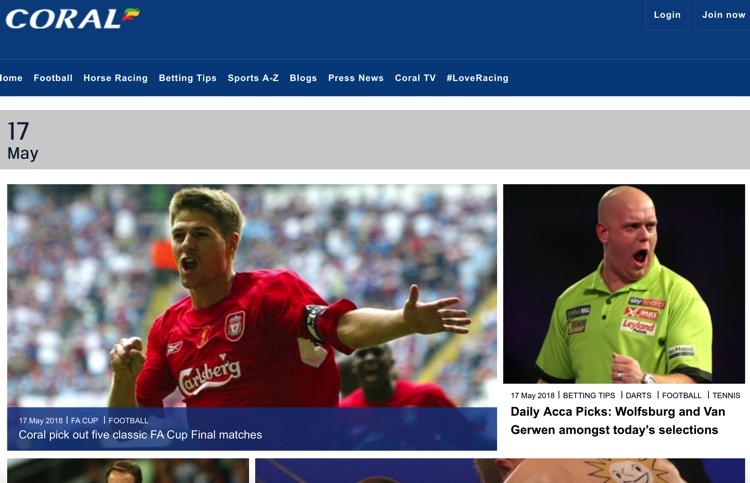 It’s like your own Sky Sports News channel, but with all articles related to betting instead of general sports news. The info on site actually offers some really good insights into potential bets. They utilise the fact there are a plethora of markets to bet on, which is good and offers a great insight. It’s also really nice that that have ex sportsmen on board to offer professional advice. For example, at the time of writing Alan Shearer is one of the many pundits associated with Coral and he often offers weekly insight into upcoming Premier League matches. It’s also worth checking out their Twitter page for videos of these interviews as well. Connect is one of the latest features on site and it allows you to link both your online account for use within their high street shop. So, it could be a case that you win money online, which you are then able to go and collect from a Coral betting shop. It also gives you a number of exclusive promotions that run throughout the year and are only available to that of Coral Connect customers. The cash out option at Coral means that you are able to settle your bets before that market has closed. The process allows you to either lock in a profit or limit your losses on your bet, which is a great feature for football punters. Not all markets are available to be used with cash out, but a good number of the higher profile bets are all on offer. What we really liked from this feature is that the bookmaker clearly states which markets are available for cash out within each game. As you can see from the image below, it’s clearly stated with the “cash out” sign. The in-play section at Coral is probably the most interesting part for us. We liked that they keep it relatively separate from the main bookmaker, which means you are solely focused on either games or markets related to in play betting. A great feature on site and something that is so simple is the fact that you can expand and collapse each league as you choose. As you can imagine, come Saturday afternoon there are hundreds of games taking place around the world, which makes this section look a little cluttered with so much going on. To alleviate this, we liked that you can either collapse a menu with that league in or simply favourite a game then click the ‘My Events’ tab at the top to see a dedicated list of your chosen games. As you work into the match itself, you are greeted with a match centre that highlights the score and which teams are paying, along with a number of vital stats to choose from. The match centre does give a brief overview of what’s happening as well, in terms of who has possession, free kicks, goals, cards, corners etc. The market coverage for most of the major leagues is actually pretty good. It continues the theme that we spoke about earlier in the article in that they are able to offer a wide range of games. 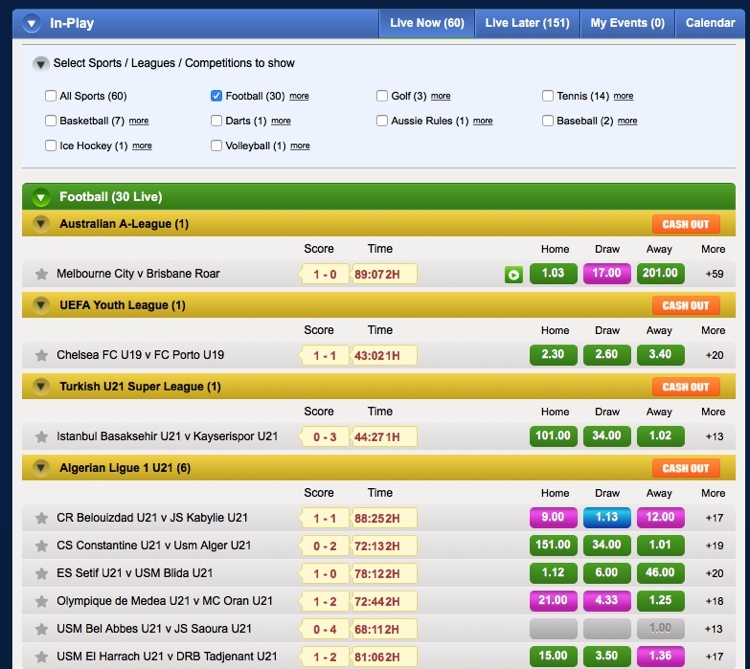 The live betting section is pretty simple to use and whilst it isn’t the best that we have tested, we’d reckon that the majority of punters will be more than happy with what’s on offer. The payout limit of £1 million for football betting at Coral is one of the biggest that you can get. Like most bookies, there are staggered tiers though depending on the league and coemption that the bets are taking place. As you would expect from the majority of the world bigger bookmakers, there are a good number of banking options to choose from as well. The likes of Visa, Mastercard, PayPal, Skrill and Neteller are all on offer. 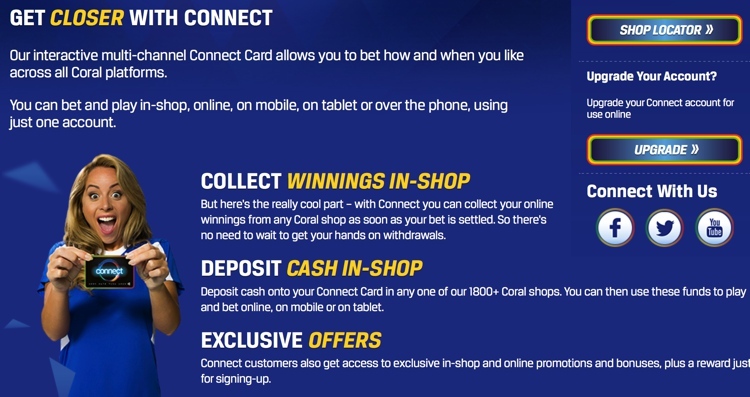 These includes Coral Connect card which allows you to load funds to your online account via a betting shop as well if you choose to. Comparing Coral with the rest of the sports betting industry definitely highlights that they are one of the biggest and best to choose. For football betting, there are few that are better to be honest, but the site isn’t without its flaws. It’s pricing structure for Premier League games were poor and whilst it did improve for lower league fixtures, it did come as a bit of shock to us to see that. Whilst they are one of the biggest and best, we definitely think there are plenty that are better and offer a stronger package for football bettors. We think Coral would likely suit the type of punter that’s looking to bet on lower league football and also for those looking for accumulator bets. Whilst pricing isn’t great, it’s very consistent which is often a better formula to get those accumulator prices up. All in all, definitely a bookmaker that is recommend, just one that possibly doesn’t perform as well as they could or even, should.